0. Don’t panic. Right: Easier said then done. Set the realistic expectations for your first art fair. Accept the fact that a (potentially significant) upfront investment is needed. 1. How to find the right booth for the art fair? 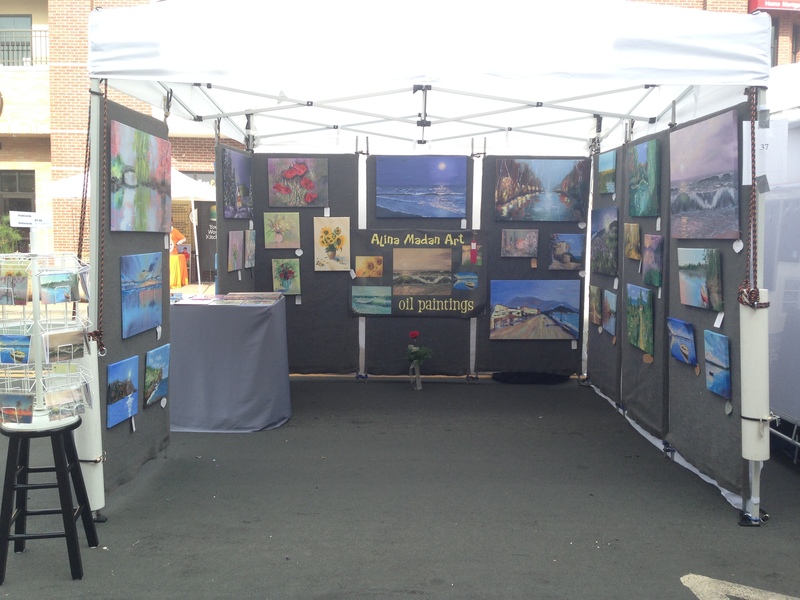 If this is your first art fair and you don’t know if you are going to continue – the goal is setup a presentable, stable and good looking booth without breaking the bank. First, check with your friends and social media network to see if anyone is willing to let you use the tent for a small fee. Considering that you are still testing the waters, borrowing the ready-to-go canopy is probably your best bet. It was hard for me to narrow down exactly what i was looking for. What is important? How will the booth look like? my family and i visited Edina Art Fair where we looked at many booths, spoke with some artists about their setup and with their permission took some pictures of the booth. Second, check Craiglist and Ebay postings. Also, post your own posting on Craigslist with the information that you are looking for an art fair setup. Be patient. I’ve posted an ad myself and got a few good replies only a three weeks. Unfortunately, by that time it was too late since we already started to build our own booth. Finding a slightly used canopy with walls, weights and some display shelves for under four hundred dollars will save you lots of time and potentially some money down the road. If you unable to find a used tent or borrow it from a friend, then you build it yourself. After long and painful research of options, we settled on a Caravan canopy from Costco. Caravan and E-Z Up canopies are both entry level options under three hundred dollars. Once canopy is acquired, it’s time to think about the walls. You can buy ready to go walls from flourish, for example. making walls yourself seems like an easy thing to do, but it’s not. We spent hours if not days coming up with the right design from the readily accessible and inexpensive materials. Finally, if money is no object then consider buying a professional setup online from a reputable source. My research indicates that some of the reputable and most used vendors are Flourish and Lightdome. I needed a booth, but I was not sure what I am looking for. My family and I visited Edina Art Fair and looked at how other artists organized the show. To hang my paintings properly on the booth panels I ended up wiring all of the paintings. Youtube came to help again! Here is the link I used to get an idea of how-to wire a painting. The hooks and wire were purchased at home depot with the help of a very compassionate store associate who eagerly showed me the section of hooks and wires to my “How can I hang a painting?” question. After all supplied were purchased i just exactly followed the youtube girl’s steps and it worked like a charm! The included strings made it a breeze to put everything together. I stapled the string to the back of the frame with my staple gun i use for stretching my canvases. From what i read on different art forums and heard from artists i came to a conclusion that i do want to create my art’s reproductions as giclee prints and some note cards and postcards. It pleases me to be able to offer my art in print form, allowing affordability to all. I started by shopping around different print studios in the area as well as online sellers. Among all the options I chose the PaintAddictStudio because the owner Justin Strom being an artist himself was really nice and answered each and every one questions i had (a lot) and even offered some very interesting ideas to think about. Also, his studio is local, which eliminates shipping charges and it won’t take me weeks to get my order printed and delivered. The prints he offered were 100% archival bearing the fancy name “giclee” meaning that images are generated from high resolution digital scans and printed with archival quality inks onto various substrates including canvas, fine art, and photo-base paper providing better color accuracy than other means of reproduction. Anyhow, for the beginning I ordered all three print options he had: watercolor 315 gram paper , 440 gram canvas and Esatin 300 gram photo prints. I must admit one can tell that the material used are of highest archival quality from the first sight. I especially loved the watercolor rag print, which is a beautiful paper with just the right amount of texture to show the image perfectly! I went ahead and ordered some of my paintings for printing in different formats. All the materials were acid and lignin free meaning they were archival safe! The bags have the adhesive strip on the flap, which allowed me to adjust the bag’s length depending on the prints’ dimensions! I also ordered some note cards from Costco and postcards from MOO. What i loved about MOO was the fact that it was the only seller offering the option to print a different image or design I on EVERY card! This way I could offer a variety of painting prints in one order! Price wise MOO was just a little more expensive than Costco. Also, their customer service was excellent: the first order had some horizontal lines on the images. The customer service rep ordered another batch for free without any questions and with apologies for the inconvenience and the prints arrived the next day in perfect condition! Vistaprint was a great option for business cards and banner printing. Their prices were very affordable after all the coupons applied. The online tools for creating cards and banner were easy to manipulate. 3 weeks prior to the fair we emailed the “save the date” email to people who are not into social media and who we want to see at the fair. And of course posted similar message on my FB Art wall. Please don’t hesitate to ask questions if you have any!